The excitement is high going into Media Now’s ninth season. 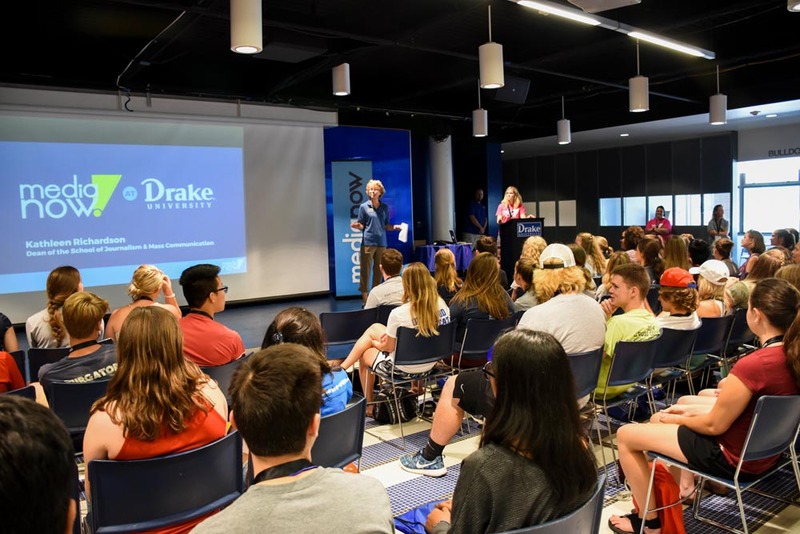 We anticipate having another highly motivated group of 250+ high school journalists and advisers from more than 40 different schools across the country come together this summer for Media Now. While we work hard to keep costs down for our campers, there are still many students under financial stress that may keep them from attending. We encourage camper sponsorship to help ease this stress. You’ll see the various options below. Each gift is greatly appreciated and given based on needs and desire to attend. You can give anonymously or, if preferred, a business or publication name can be added to the camp materials at the various levels. Please send any questions about becoming a sponsor to co-director, Kate Manfull (kate@medianow.press). Thank you for your generosity in advance. This level of sponsorship helps a camper make the first steps towards a camp experience. You can identify a specific recipient or donate to a fund that helps those in need of financial assistance get to camp. Product donations for camper bags are also accepted at varying levels. Have a treat to share with students that gets your business name into their hands? Contribute to the camper goodie bag. 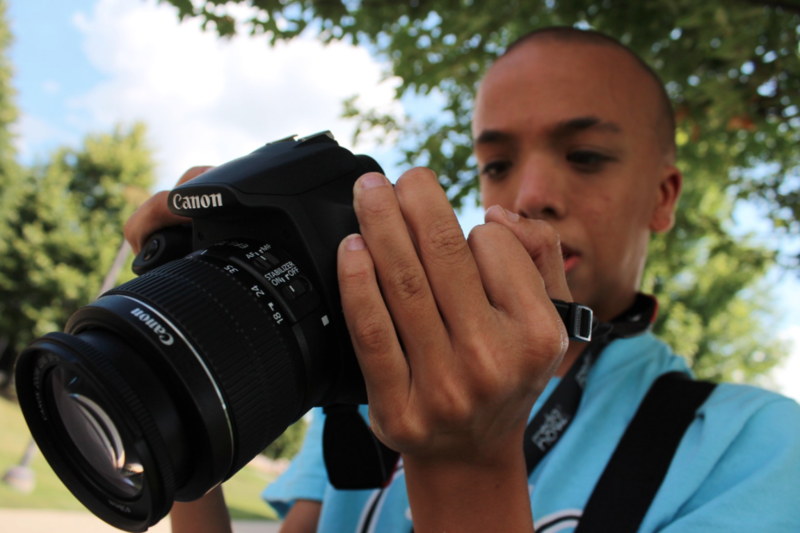 Your generous gift of $300 will provide a deserving journalist with the full camp experience no matter which camp location they choose. This gift will cover the cost of attending camp, course fees, meals and assist with housing (if needed) during the bootcamp. Give anonymously or have your organization recognized as a camp sponsor. We are looking to fill three lunch sponsorships at Webster University camp in St. Louis this summer. With this sponsorship you’ll get direct access to the students through their individual meal times each day. Let’s get creative and develop an activity or opportunity for the campers to engage with your product or service during their break time. As a title sponsor of the camp, you get access to students, parents and advisers through on site signage and promotional items, visual space in large group sessions, social media posts, sponsor listing on printed and online materials, logo placement on camp t-shirts and our on event app plus permanent placement in our email communication. Each title sponsor experience is custom-built. This sponsorship level is per camp location. WANT TO GIVE MORE? WE HAVE OPTIONS. ENEWS ACCESS Our customized title sponsorships include access to camper, parent and advisers through our email communication. You will have two customized messages and two featured spaces within all camp emails. VIDEOS We create videos specifically for this camp about your brand, then share online and in large group sessions. PHOTOS If you donate items with your name on them, we capture excited students using or wearing your business name, product or gift. SOCIAL SHARE Custom games and contests get your business repeat mentions and direct ties to the students and advisers at camp and external online play. CUSTOMIZED INTERACTION We work with you to customize branding opportunities with our campers that make it a fun and rewarding experience for all. Scavenger hunts, texting games, awards banquet sponsorship or take-home packages for attendees—whatever your fancy. We want to make it work for you. If you’re interested in sponsoring just one camper to attend camp or to serve as a title sponsor of the camp experience, we encourage you to reach out to Kate for the win-win options.